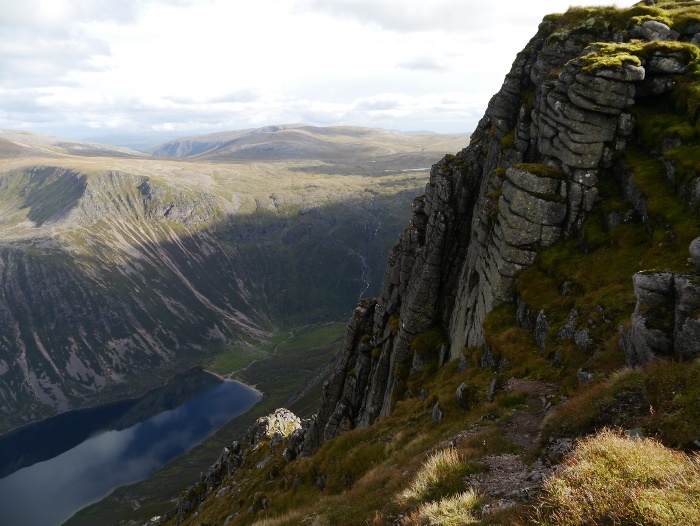 The summit cairn is right on the edge of a two thousand foot drop straight down into the loch below. It had turned out to be a lucky Friday the thirteenth, with warm sun and barely a breeze on this lofty Munro. It was early evening so all the day trippers had returned back into the glen for the night. 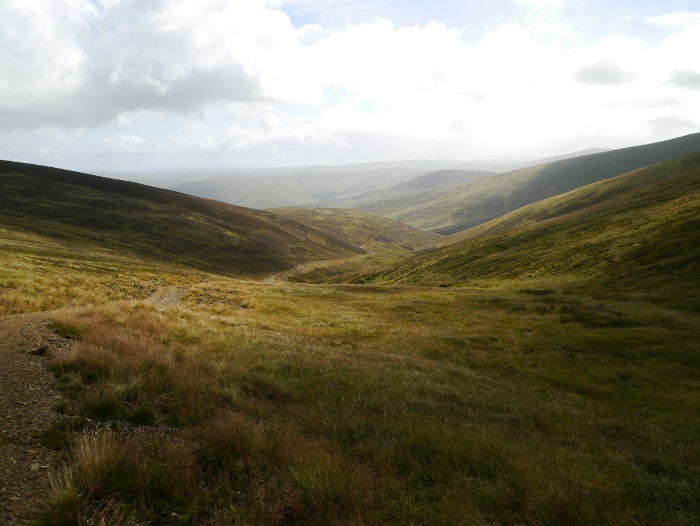 I stood alone tracing out a route across the high plateau, working out where would be good to camp. A couple of hours later I was pitching bang on the nine hundred metre contour. The next night the promised first storm of the autumn was battering the high tops. One of the major benefits of being a bit of an obsessive peak bagger is that it often takes you into unknown and less frequented corners. This is especially the case with the little known Donalds and their tops. 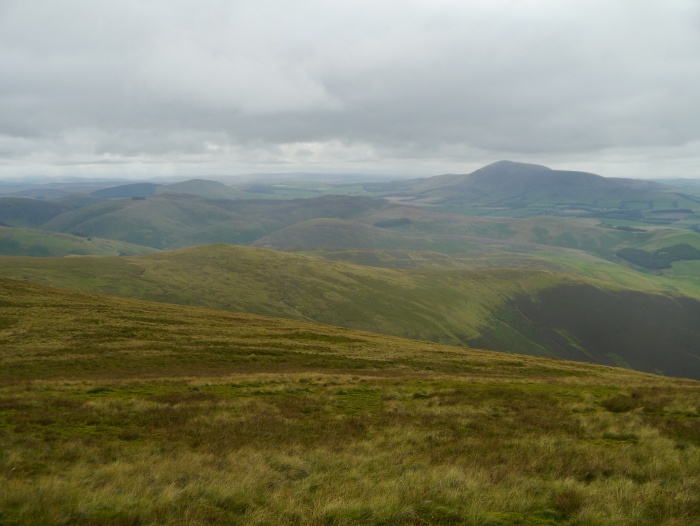 These hills are located in the Scottish Lowlands and are over 2,000 ft. What constitutes a Donald makes about as much sense as the list of Munros to be honest. What appeals about them to me however is that they give an achievable target and don’t involve a twelve hour drive to get to for this Nottingham dweller. Secondly, hardly anyone bothers to climb them, an obvious bonus for this misanthropic hillwalker. 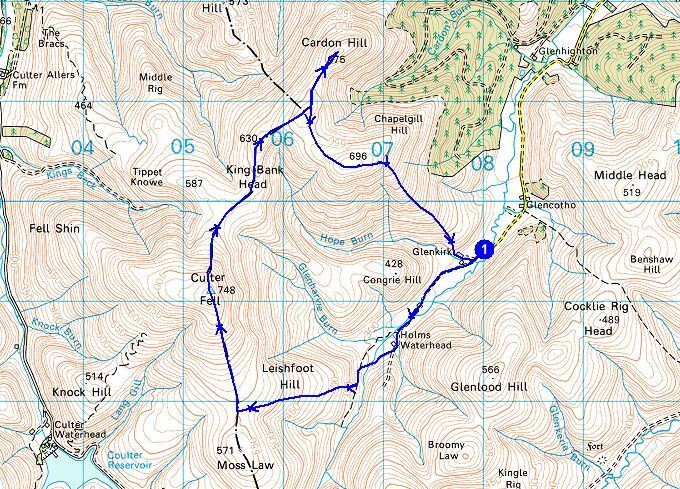 Just in case you were wondering, a Graham is a Scottish hill between 2000 and 2499 ft with a drop of at least 150 metres. Now you know! The only real problem these days with the Donalds is that they have become a target for companies that like to implant 500 ft steel towers into the hills. 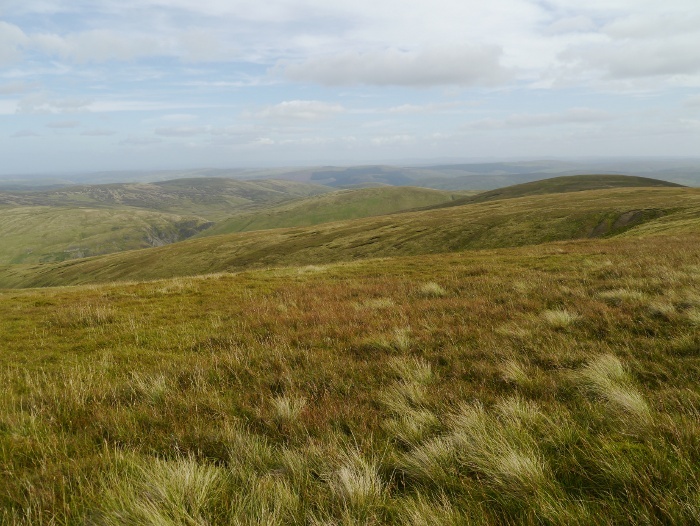 Parts of the Southern Uplands are positively bristling with them now. 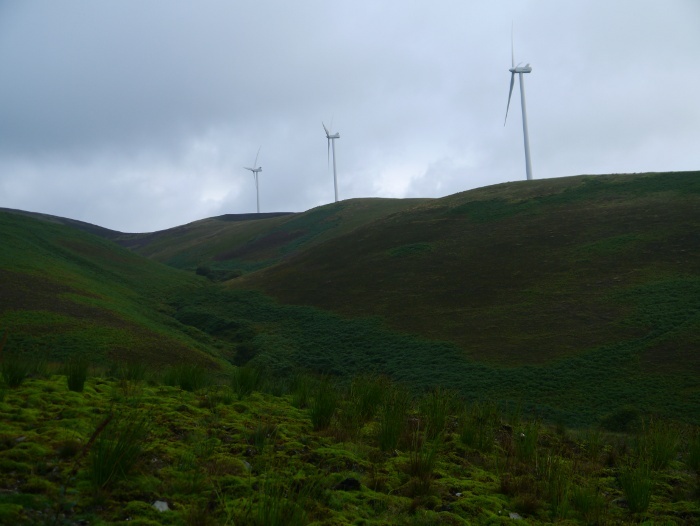 These lovely velvety hills were first covered in ranks of artificial forestry plantations and now as a final insult huge numbers of turbines. With a four day weekend in the bag I had planned to make an escape to the Southern Highlands on a Munro based mission. The weather forecast was not very promising though, low cloud and strong winds dampened my enthusiasm somewhat. 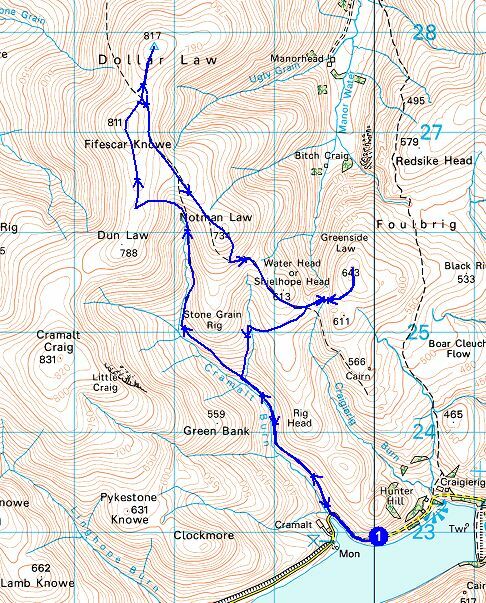 With my heart still set on walking in Scotland I decided to head further south. Hopefully the promised clag would hide some of the monstrosities lurking in these hills. It was early afternoon when I parked the Bongo near the end of the public road through Holms Water. This glen has a real feel of being off the beaten track, I can’t imagine that it ever gets overrun by bobble hatted ramblers. Reuben had once again gone through the ordeal of being in the back of the Bongo for five hours so was very keen to get started. Whenever I looked in the rearview mirror on the drive up he would be sitting bolt upright straining to look through the windscreen. The house at Glenkirk has a well-tended garden that would not seem out of place in wealthy suburbia. All manicured lawn and perfect flowerbeds it contrasted strongly with the surrounding bare grassy hillsides. The final building is Holms Waterhead which is much more my sort of place. A bit rough round the edges, blending in quietly with its surroundings. 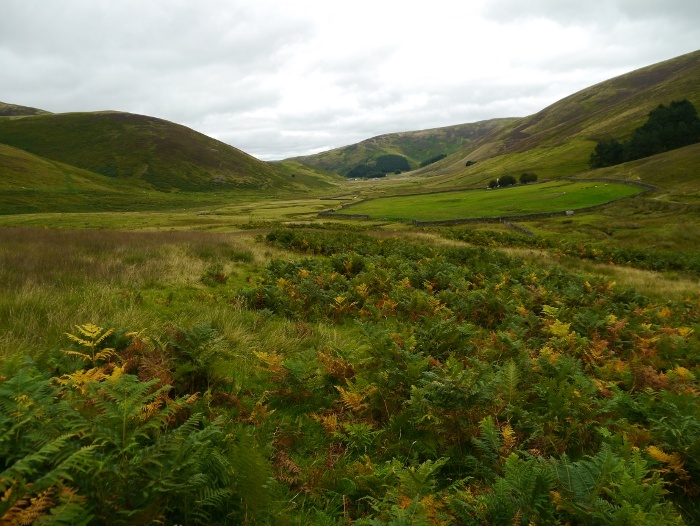 What struck me however was the fact that it was only the end of August and the bracken was already turning. 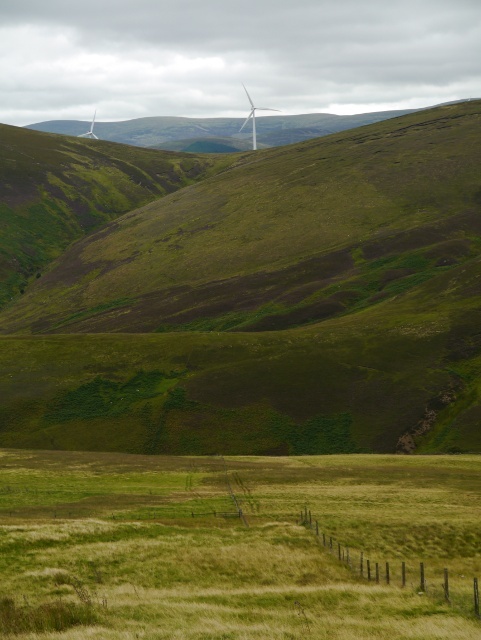 Climbing the steep grassy slopes of Leishfoot hill I was surprised to hear the thwump thwump thwump of the turbines that are situated on the other side of the glen. Although the nearest is over a mile away I could not believe just how audible they are. Along with the noise they also did not look particularly pretty, dominating the view across to Dollar Law. 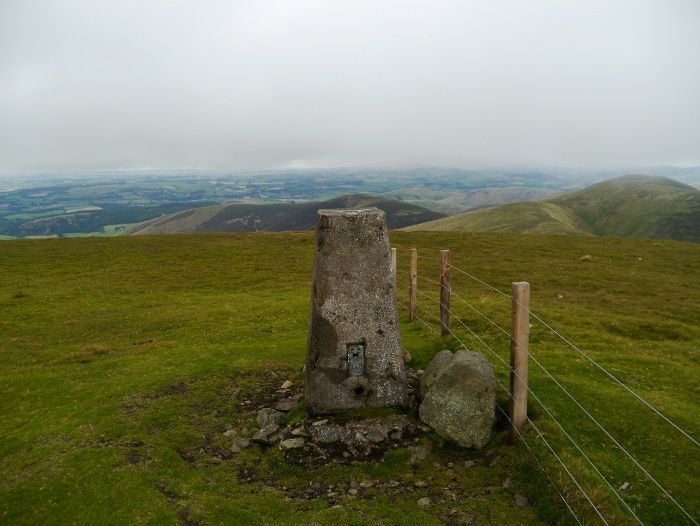 Once on the ridge it was simply a case of heading up to the summit of Culter hill, extensive views across to the Lowther hills. In the photo below due to the direction I was facing and a combination of mist and bright light there are many things that are hidden from view. These many things are the 150 plus huge turbines of the Clyde Windfarm. I have to admit that I was a little transfixed in awe of its size and scale. As far as the eye could see were giant towers of spinning steel. Impressive, but not in a good way. Unfortunately turning the other way I was faced with this. 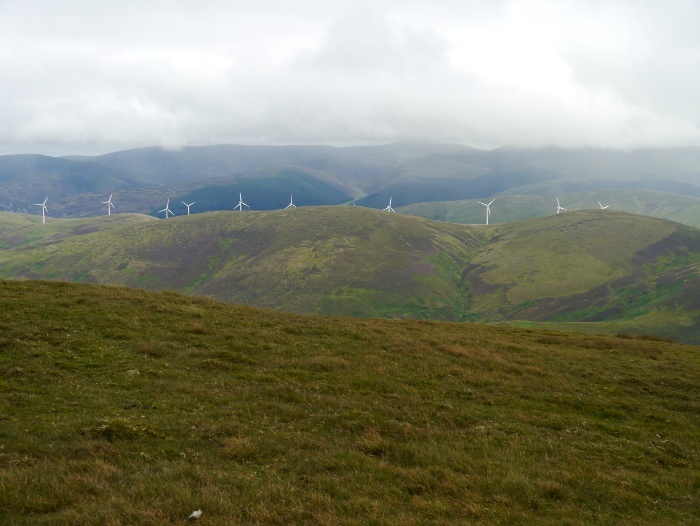 Another hill, another windfarm. 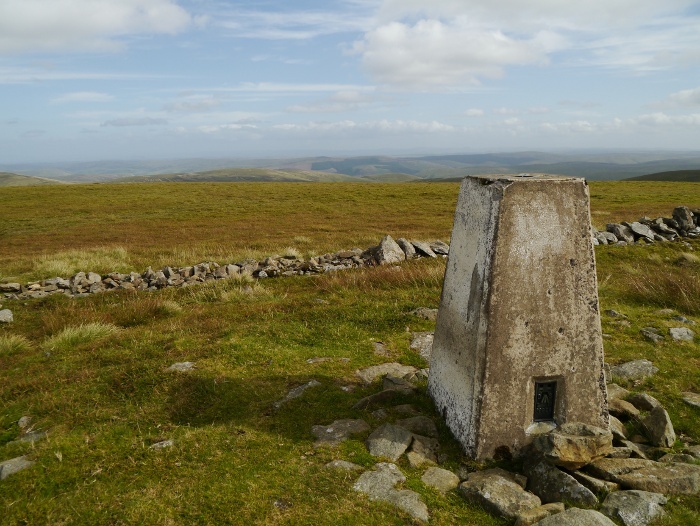 Despite the surrounding blight, Culter Fell is rather a cracking hill, rising head and shoulders above its surroundings. With the flatlands to the north there is a sense of height and space. The isolated bulk of Tinto is a dominant feature of the view. We did not hang around for too long though as there was no shelter from the keen wind. Being an ardent bagger I was soon leading the enthusiastic Reuben (actually he led the way) to the Donald top of Cardon Hill. A place to sit in the wind ruffled grass and just stare. I don’t think that anyone witnessed a fully grown adult run away from a wasp though. 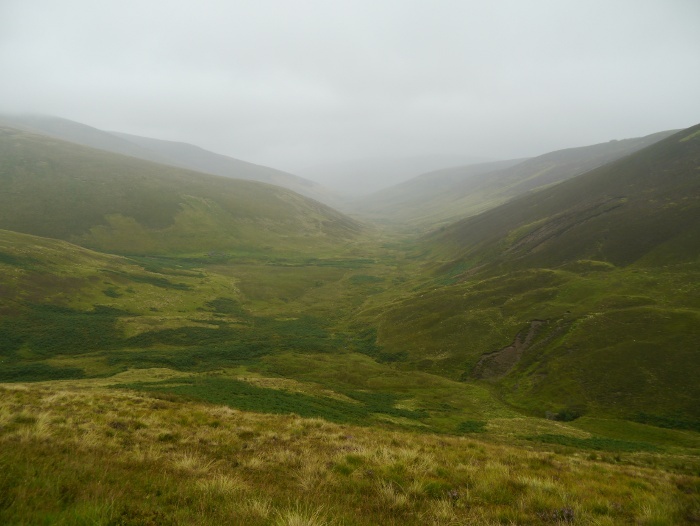 The weather decided that it had been too kind by the time we reached Chapelgill Hill, as an atmospheric mist swept into the glen. 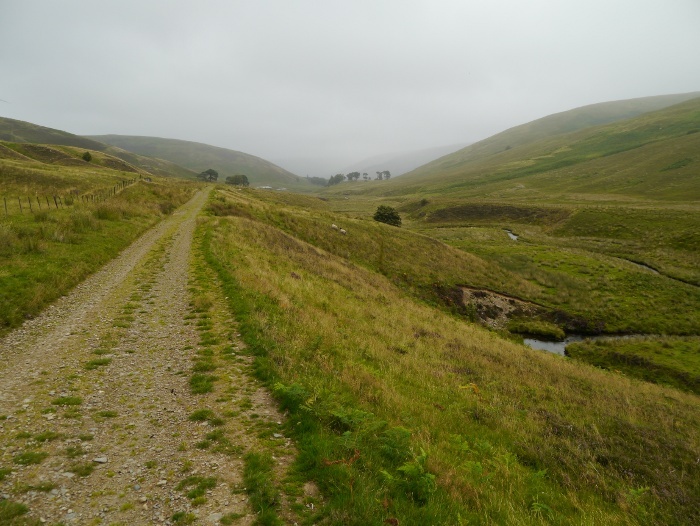 I had a feeling as I descended back to Holms water that we could have been walking in the Cheviots, so similar is the scenery. 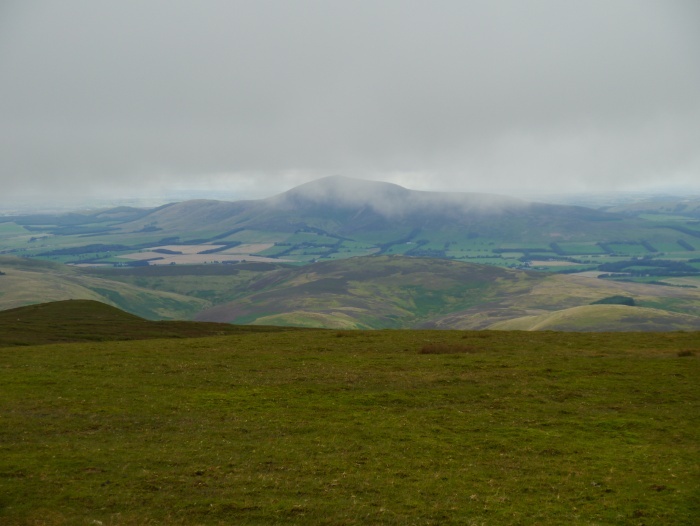 The difference is that the Cheviots are in a National Park and are protected. These hills are viewed as a resource to be trashed. 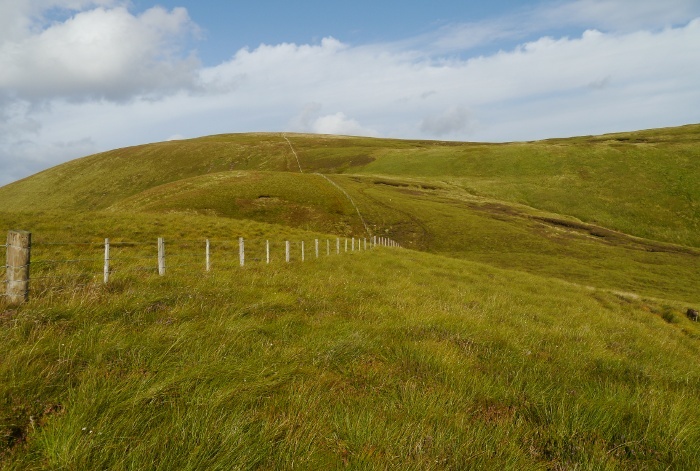 As this thought was going through my mind I spotted another anemometer on a nearby hill…………………..
And yes as I thought there is now an application in to extend this windfarm. I really should stop googling these things. Back at the van I trundled down the glen for a couple of miles and parked up just off the single track road. With only three dwellings further up the road it was a very quiet evening and night with a good book and the dog for company. The forecast for the day was rubbish, no matter what website I checked. Therefore I festered in the van until midday, working my way through the previous weekend newspapers. Eventually I mustered some enthusiasm to get out in the weather and drove down the A701 to park at the start of the access track for the Glenkerie windfarm. It took some effort to haul Reuben over the locked gate and I decided to ignore the sign saying that I must phone and report my presence. On the plus side the track meant that we could bypass the farm buildings at Kingledoors. I’m never too keen on taking Reuben through farmyards when there is no right of way. The glen of Kingledoors burn is one that has tempted me for years on the map. Apart from the great name it is long and leads deep into the hills. Also there is a bothy towards its upper end that I have wanted to check out. 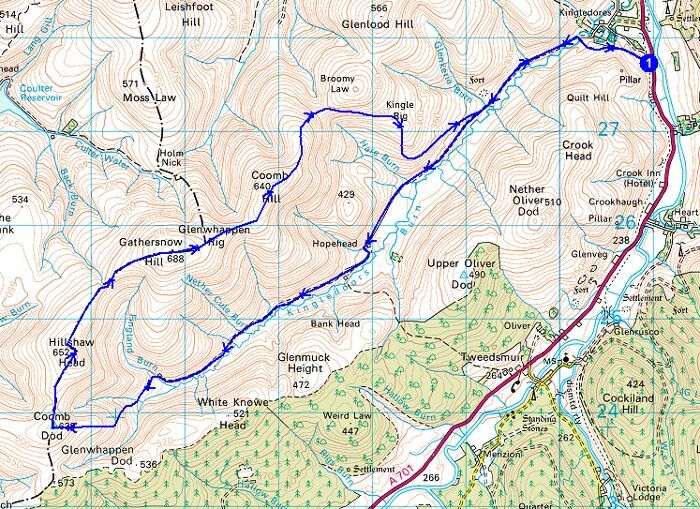 The Glen did indeed give good walking but it turned out that the bothy was private and locked. Cracking location though. The weather had been teasing me on the long walk to the head of the glen, a misty drizzle not really enough to get the waterproofs on. However once we started the steep climb up Coombe Dod it finally closed in. 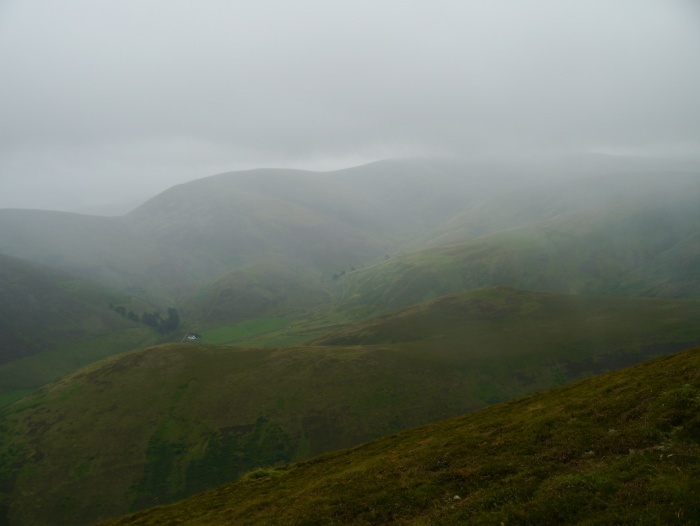 Mist, rain and strong winds combined to make the walk along the tops more of an ordeal than a pleasure. Still it was fresh air and exercise, always the prefered option to being stuck inside. 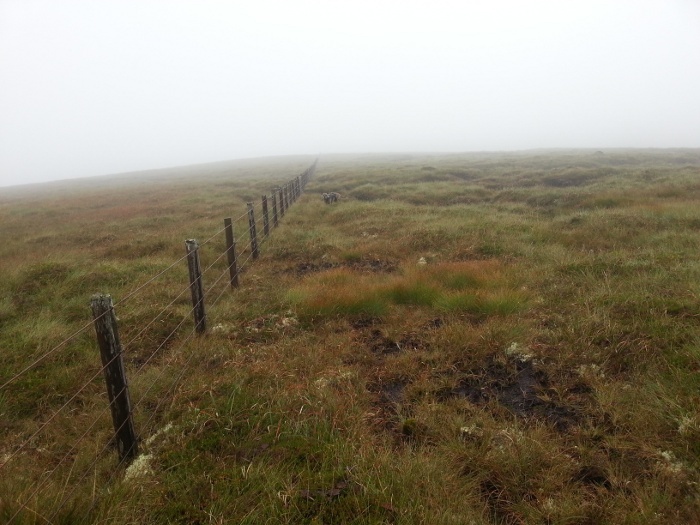 At least the fences gave a handy rail to follow over the hills. Approaching Broomy Law the mist broke and I came face to face with the wind turbines. Even from a few hundred metres away they looked enormous. 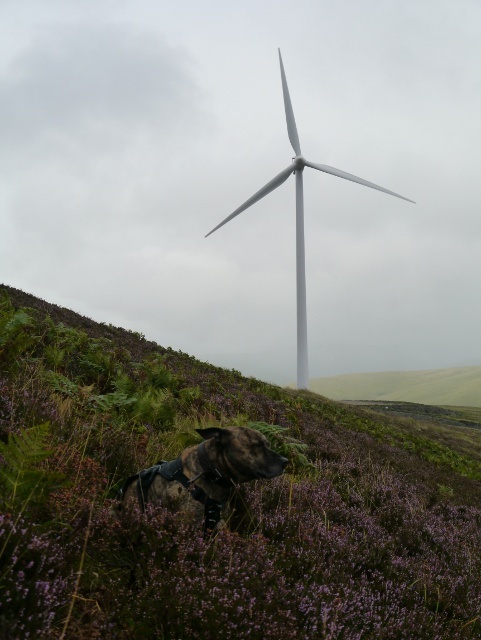 I was keen to get up close and personal so contoured round the hills to approach turbine number one. I ended up walking directly underneath, craning my neck upwards to watch the blade whoosh round. What struck me was just how large the hardstanding next to it was, you could fit a small city car park next to just one turbine. You can tell that even from a distance Reuben was not impressed. We picked up the access track and followed it back down into the glen, the weather clearing even more. Some truly lovely scenery has been ruined here. 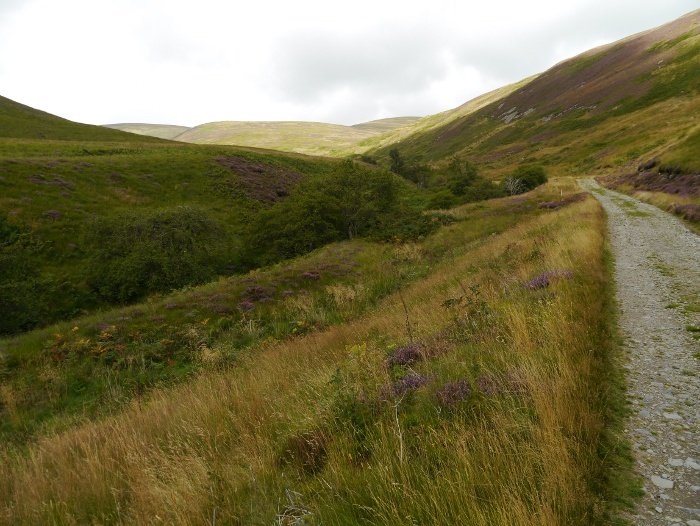 There is one small section where the track meets the glen floor that with a small amount of imagination you can pretend you are in the Highlands. I have a terrible habit of imagining that I am somewhere better. With a spot of Donald bagging carried out I was keen to escape into a much wilder landscape currently untarnished by development. 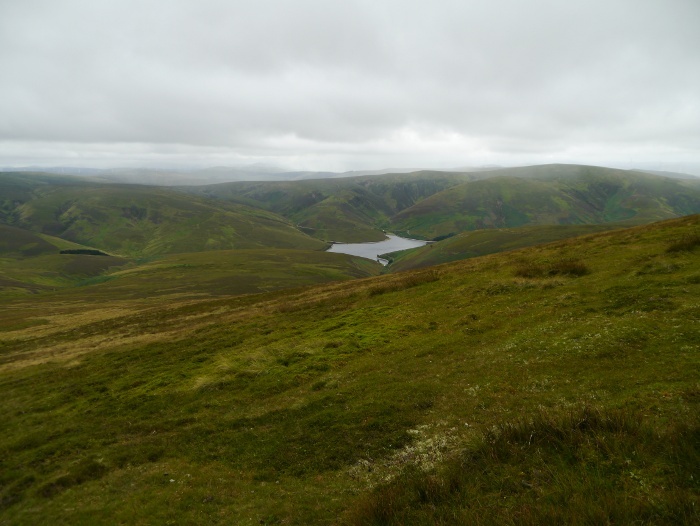 I headed the Bongo east, passing through Tweedsmuir and along the Talla reservoir. 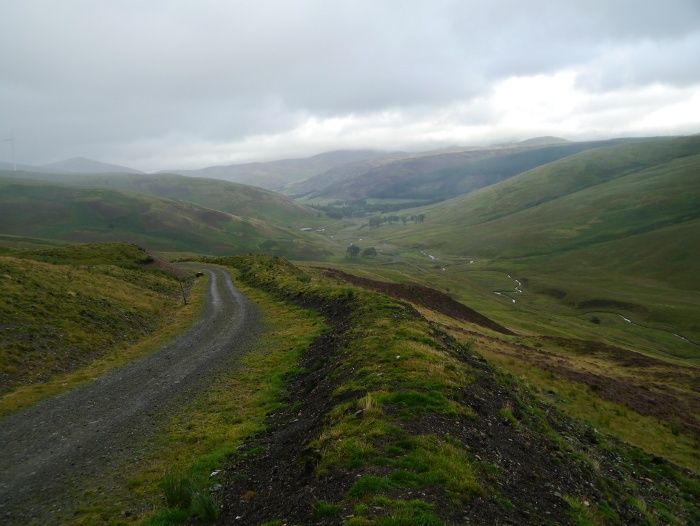 At its head the high hills reach towards the clouds and a steep single track road clings to the hillside. It was fun enjoying the drive up the steepest section until I was face to face with a car coming downhill. Neither of us was prepared to yield (no passing places for miles) so somehow we squeezed past each other. I was very aware that I was inches away from a big drop. 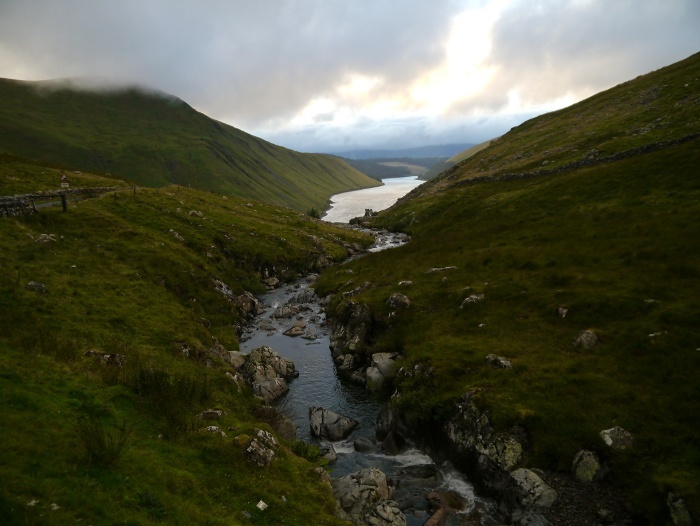 We then stopped for a while at the bridge over the Talla water for the classic view down the length of the reservoir. The road rises to 452 metres before a small drop down to the Megget reservoir. 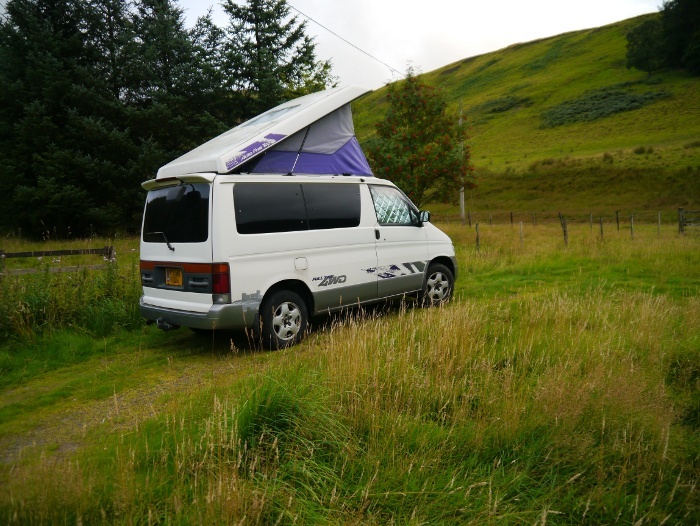 I found a great off-road car park, large grassy bays perfect for parking a campervan. At this exposed spot the wind was keen to make its presence know. I spent the night with the Bongo being rocked, the sound of the wind blowing through the surrounding trees. I woke to sunshine but the wind was whipping white horses along the surface of the reservoir. I knew that it was going to be breezy on the summits that day. However I was happy to have the promise of good views even though I would probably get battered around a bit. It was warm in the van so it took a while to muster up the energy to make lunch, pack my sack and head off. 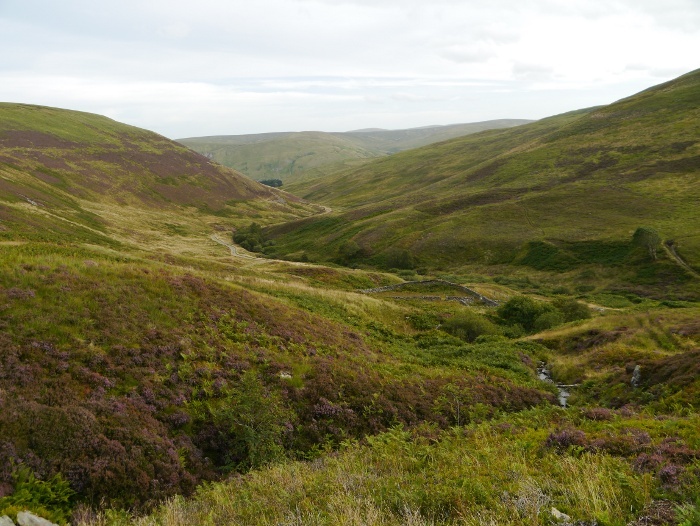 The Cramalt burn is another long and twisting valley that leads into the high hills. It looked like there was a shooting party at work on Green Bank above, but I did not hear any shots being fired. I have to admit that I did not see a single grouse during the entire day. Hopefully they all go on holiday somewhere nice come 12th August. 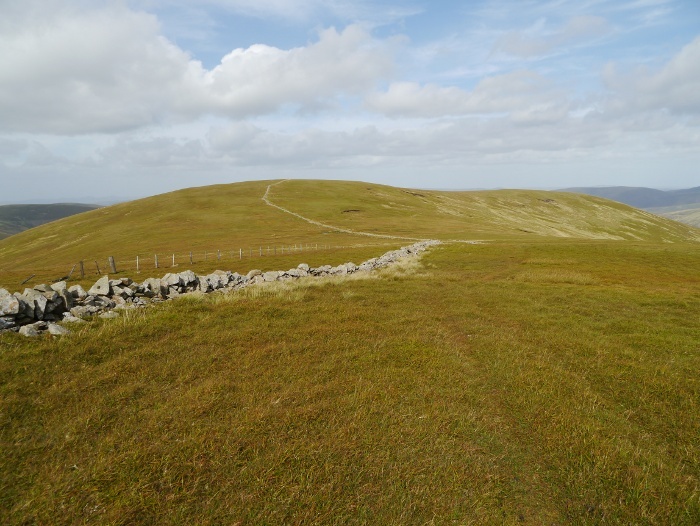 With a good track underfoot we were soon on the extensive plateau between Broad Law and Dollar Law. A large area sits above the 800 metre contour and with gentle slopes and cropped vegetation the walking is as easy as it gets. The wind was unimpeded up high on these exposed hills and was hitting Reuben firmly between his sails. 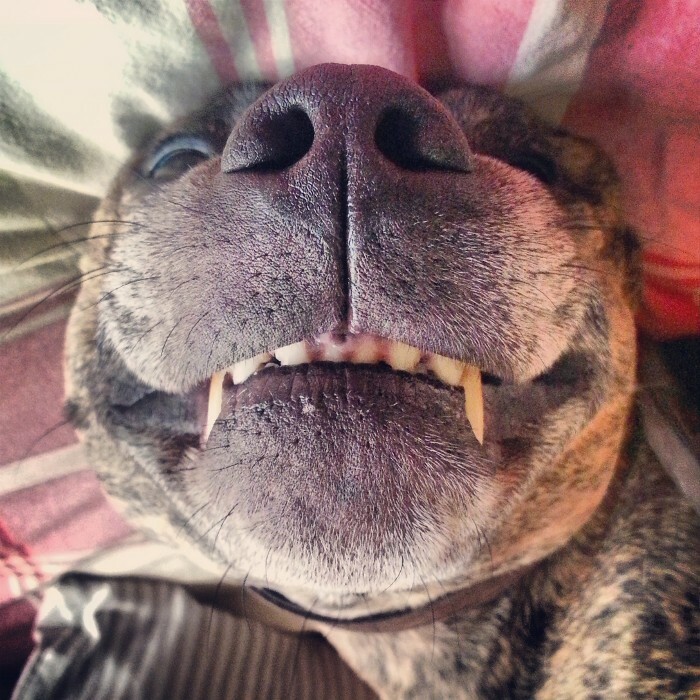 He was running around like a lunatic throwing himself on his back every now and then, a huge doggy grin on his face. He was having the time of his life. 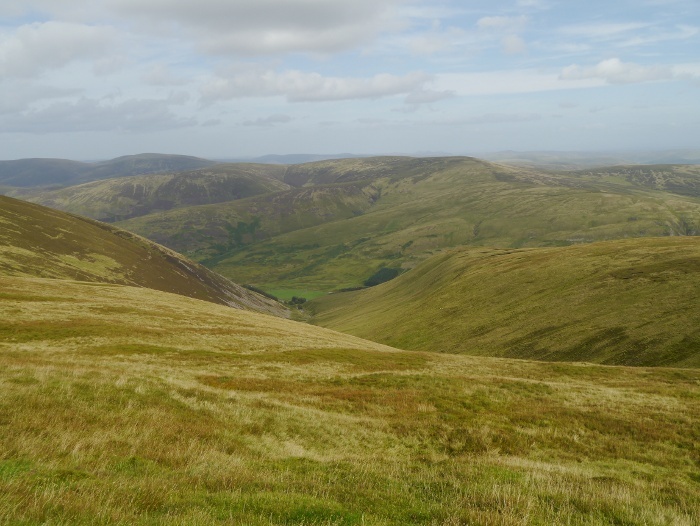 There is a great feeling of space on these hills which spread for miles to the south and east. 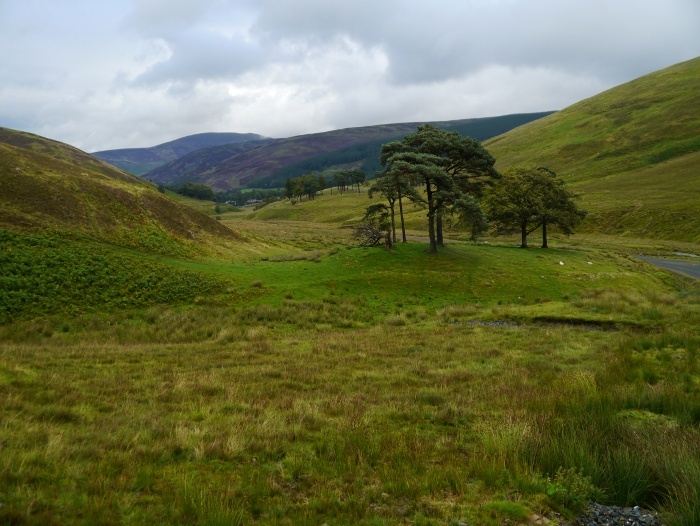 I really do hope that they are left alone as they are a real gem of the Southern Uplands. I also had them all to myself with not another hiker seen all day. Beat that Lake District! We followed an old grassy track as it contoured high along the hillside. It gave the sort of walking that you wish could go on forever. The pleasure to effort ratio was firmy skewed towards the side of pleasure. 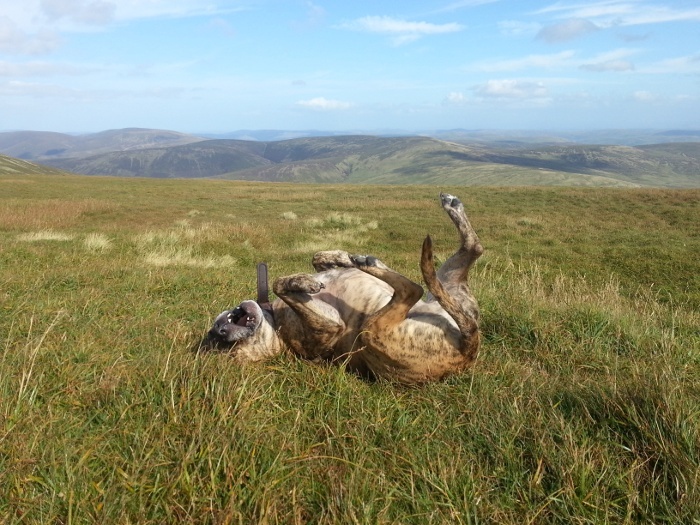 In this sheep free, post nesting season time Reuben enjoyed the total freedom of the hills. He was off in all directions leaping through the grass and heather as the terrain gradually got rougher as the hills got lower. 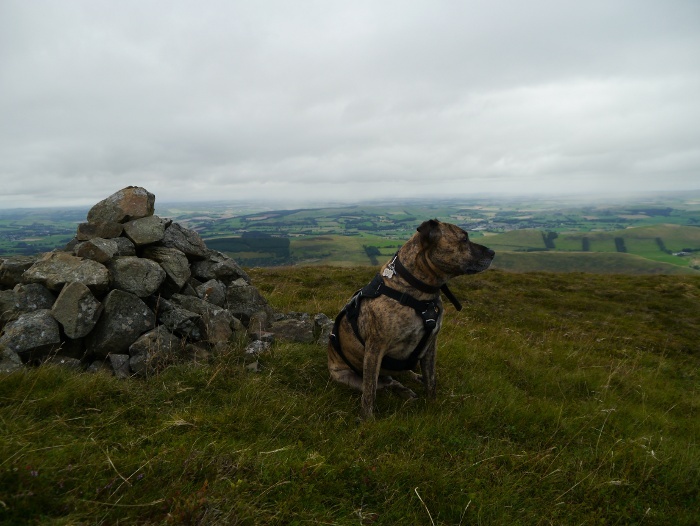 The final bag of the day saw a there and back outing to the summit of Greenside Law. It was good to get a phone call from my mate Graham whilst on the hills. He was off up to the Isle of Arran with his partner and decided to come and camp with me for the night on the drive up. I gave them the location of the Bongo with the hope that they would appear later that evening. 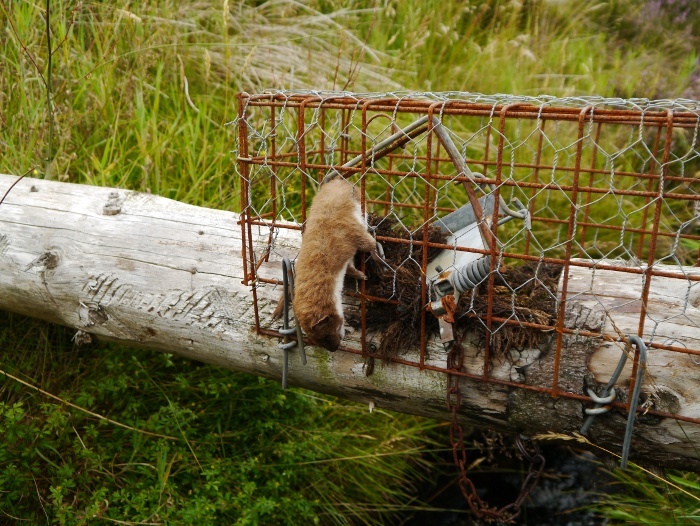 As well as turbines, the Southern Uplands are absolutely plastered with spring traps placed on poles over watercourses. Nowhere else have I seen higher concentrations of these things. 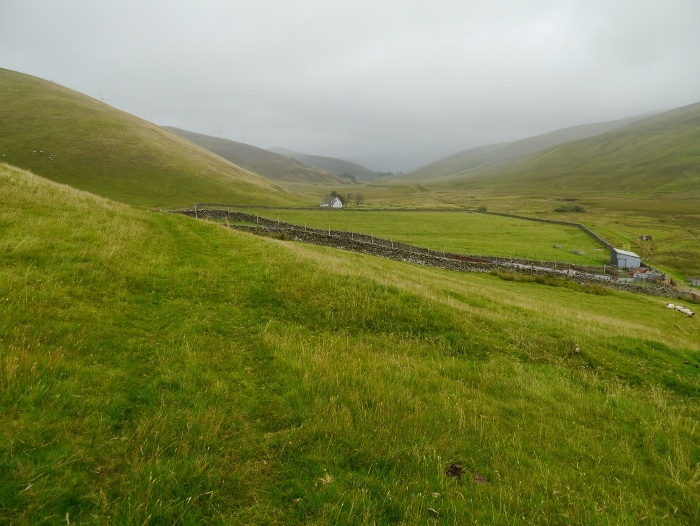 I’m not sure what the aim of this estate is as the hills appeared to be devoid of life (including grouse). A solitary hare and a buzzard the only wildlife spotted all day. We arrived back at the track down the Cramalt burn, giving an easy and scenic end to the day. My friends Graham and Rae did indeed turn up later that evening and we had a convivial evening eating and drinking outside. It was an evening for down jackets and hats though as the temperature took its first slide into autumn. The wind gave us a good battering, only the lee of the Bongo providing any source of shelter. Even their Terra Nova Quasar mountain tent was deformed under the heavy gusts. Turbines aside this area of southern Scotland remains one of my favourites. Somewhere you can walk all day and not see a soul. 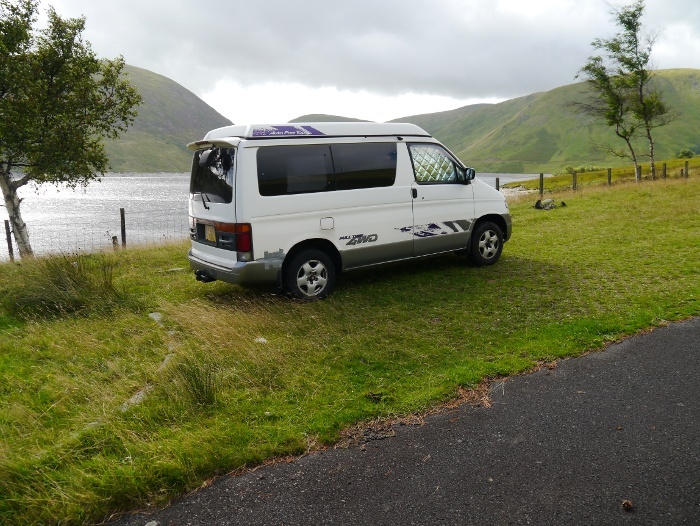 There are plenty of places to hide away in a campervan safe in the knowledge that you won’t get disturbed. Give the overtrodden honeypots a break! Not the most flattering photo of my hiking companion.